Quantum Code Review - Scam Exposed! Quantum Code is a relatively new binary trading software, but it has already gone viral judging from the number of complaints we have received from our readers. We decided to launch an investigation to determine if Quantum Code is a scam, and we got our answer. As promising as it sounds, don’t buy into it. Read the full Quantum Code review to find out the truth before you walk right into a scam! There are times when online scams went too far in terms of generating hypes and promising potential profits – Quantum Code scam is one of them. As soon as you enter the homepage, you’ll be greeted with only a headline and a sales video. The headline is highly exaggerated, promising a profits of over $1,892,460 every month. Of course, this is just an arbitrary number, as it is nothing more than a shady marketing tactic used to make you watch the sales video. 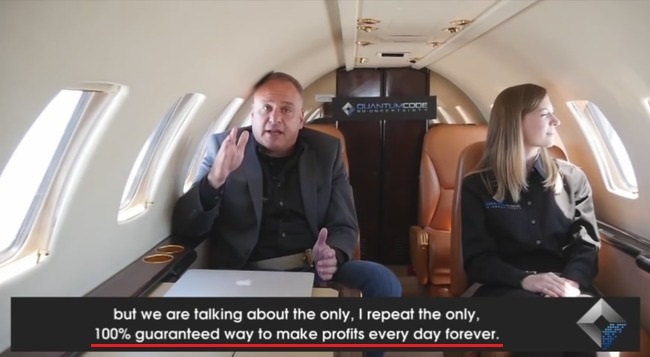 It’s in the video where Michael Crawford, the alleged owner of Quantum Code scam tries to brainwash you into investing. Did you notice how the sales video started with slideshows of exotic vacations, luxurious residence, high-end sports car and private jet? It’s a way to attract your eyeballs and make you think that you can achieve all these with Quantum Code software. More importantly, it’s the first step to the brainwash session. Before we get to the evidence, let’s take a look at how binary options and Quantum Code software works. How Do Binary Options and Quantum Code Work? Binary options is a highly popular trading instrument due to its simplicity compared to other instruments such as stocks and Forex market. Instead of reading up financial news and analyzing charts, binary options traders mainly rely on “trading hunch”, where they guess if an asset’s price will rise or fall after a short period of time. This is how it works – let’s say I predict the price of AAPL stock will be higher 1 minute later, and I bet $50 on a 1-minute binary options contract. If I’m right, I win a certain percentage of what I bet, usually 60% to 80%. But if I’m wrong, I lose the entire $50 that I bet. As you can see, trading binary options is not that different from gambling. There’s no way to predict the market movement in such a short period of time. It’s just like trying to guess the outcome of a series of coin toss, and to get them right consistently. Is that possible? Of course not. Even if you manage a 50% win rate, you’ll still lose money due to the uneven winning vs losing payout. It’s so risky that even Forbes warns us against gambling with binary options. And this is where Quantum Code comes in – it introduces itself as a fully automated software that trades binary options on your behalf. It’s said to analyze the market and mirror other people’s trades, and beating them in speed by buying or selling before them using advanced algorithm and lightning fast servers. To be honest, these are just some poorly designed lies used to confuse inexperienced internet users. Firstly, for a system to mirror other traders, it requires the software to place the mirror trade at the exact same time (at the bare minimum) in order to get the same strike rate. Beating them in speed requires it to place the trade BEFORE the traders do, how is that possible? Secondly, if the system is just mirroring other traders, how do they guarantee the outcome of the trade? As we’ve presented earlier, the odds are stacking against the traders in binary trading. Quantum Code did not specify the traders that they mirror, which means the results will be as best as the average traders – and majority of traders lose money due to the uneven winning vs losing payouts. How do Quantum Code even make sure it’s a winning trade they are mirroring? Apparently Michael Crawford conveniently left out this important detail. Now let’s debunk some the fake promises made by Quantum Code scam in their sales material. Is there really a way to make guaranteed profits online? 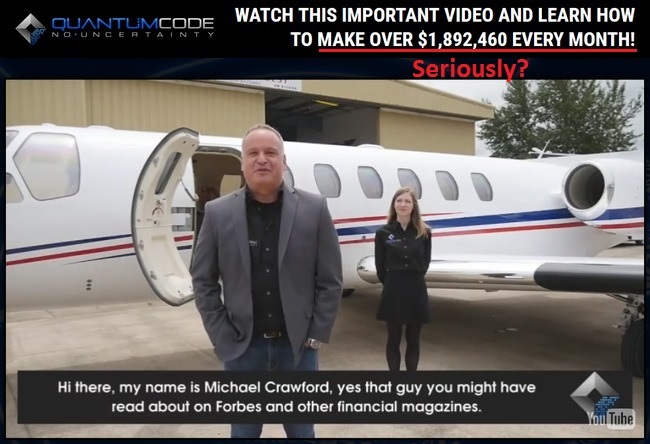 Michael Crawford has made some pretty outrageous claims in the sales video. One of them is his 100% guarantee to make you profits every day, forever. 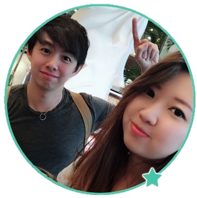 Not only that, since this is an automated binary trading software, it means that you don’t need to put in any effort, and still make massive profits from his software. We have found the absolute evidence to prove that Michael is not telling the truth, and it comes in the form of hidden terms in its own disclaimer. Let’s take a look. As much as the scammers behind Quantum Code want to keep you in the dark, they have to reveal the true nature of the scam somewhere within the website to avoid legal actions. They chose to hide the truth deep within the disclaimer. You can’t find this document anywhere in the sales material, because it’s supposed to be hidden from you. The only way to access the document is to scroll to the very bottom of the sales page and click on a very small fine print that reads “disclaimer”. You can authenticate the terms we have quoted here against the original document on their own website: thequantumcode.net/terms. You should be aware of all the risks associated with foreign exchange trading. Quantum Code scam expects you to understand all the risks associated with foreign exchange (and derived binary options), and the very real possibility to lose money. Despite promising you guaranteed profits, the scam admits that it requires risking money to trade. It’s your own fault if you use Quantum Code and lose all your money. NO trades have been executed using Quantum Code automated system. All results shown are simulated. Fact #3 alone should be enough to alert you to steer clear of the scam. How can you trust a software that has never generated any real profits before? What’s more, they were using fake profits in their sales material to deceive you. The sole purpose of these terms is to protect the scammers from legal actions when you lose all your trading capitals. Without you reading it, you are expected to understand the risks that come with binary trading and take responsibility for the loss. If Quantum Code scam wanted to be upfront about the risks and the fact that no actual trading has been done using the system, they would’ve told you in the sales materials. Unfortunately, the truth of Quantum Code scam can only be found in the risk disclaimers, in which the majority of victims don’t get a chance to read it at all. YES, QUANTUM CODE IS A SCAM. We strongly advise you to stay away from the scam if you don’t want to lose your hard-earned money. You’ll be better off spending that $300 deposit for a nice dinner with your family than wasting it on a scam like this. Mirror Trader Review – Scam Exposed!